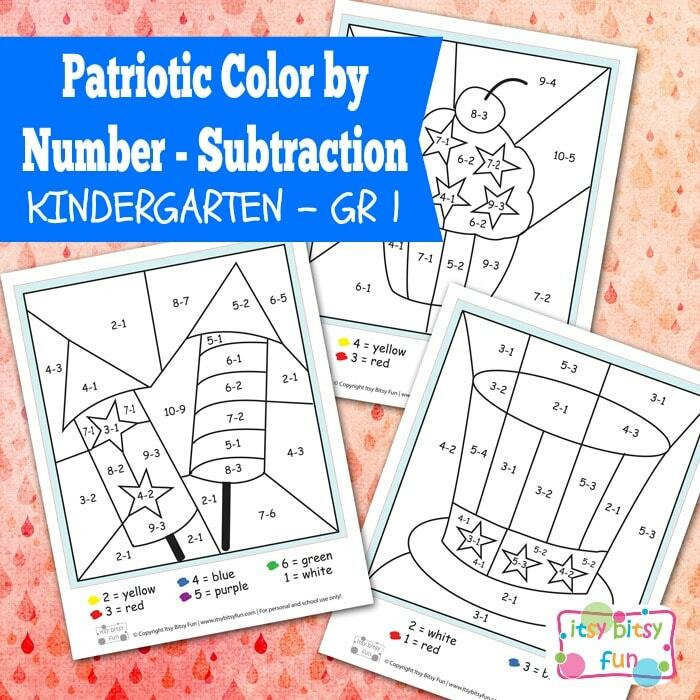 4th of July Color by Number Subtraction Kindergarten Worksheets are great to use alongside hands on activities to help with subtraction. If you are working on addition I also have 4th of July color by number addition kindergarten worksheets. As with addition I strongly believe these shouldn’t be used to teach kids subtraction. Hands on learning and learning through play is by far more effective and will make it easier for kids to get a grasp on the subject (I know I had issues with this as a kid). But once they know their math these can be used as a tool to keep them on top of it! Fun and stress free! Let’s start coloring shall we? Subtraction can be tough so chances are kids won’t finish these in one go (or never). It is OK if they don’t – let them do as much as they wan’t and can to make math stress free (I think we all know how scary math can get). Get your free printable 4th of July Color by Number Subtraction Kindergarten Worksheets here. My collection of printable worksheets for kids is getting bigger each week so be sure to browse them (and check back if you like them).